BANGKOK – Countries in Southeast Asia have launched a 10-year action plan to strengthen their intellectual property rights cooperation, with the European Union and the World Intellectual Property Organization providing financial and technical assistance in helping the countries to achieve their goals. The plan is being implemented as the current Thai government sets to apply innovation in driving its economy, a policy being coined as “Thailand 4.0”, with the creation of a new ministry known as Ministry of Digital Economy and Society in September this year. The plan is available here [pdf]. However, private experts said that Thailand still lacks innovation capacity and qualified scientific research institutions while private and public spending in research and development remains minimal. These inadequacies would make it difficult to turn the economy into an innovative one, they said. “It is recognized that intellectual property (IP) has an important role in contributing to the achievement of national and regional socio-economic development goals,” it says in the introduction of the IP Rights Action Plan 2016-2025 of ASEAN, or Association of Southeast Asian Nations, of which Thailand is a member. The action plan was launched as ASEAN, a fast growing region in the world with a combined population of 625 million, is moving to integrate its 10 members’ economies under the ASEAN Economic Community (AEC) agenda. 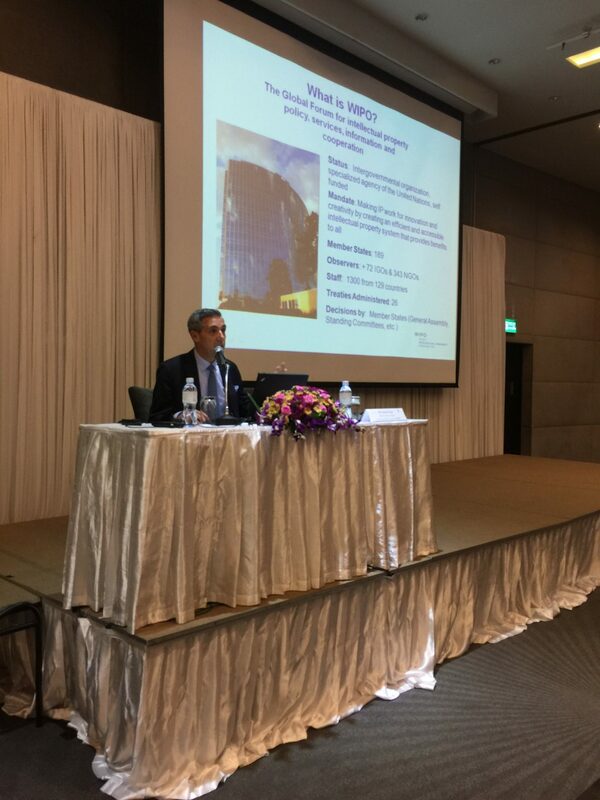 Thailand’s Department of Intellectual Property (DIP) organised a seminar on 14 December to educate business people about the plan, and invited a representative from the regional office of WIPO and another from the EU IP Office (EUIPO) to talk about the two organisations’ contributions to the ASEAN efforts. The plan, approved by ASEAN member countries in mid-2016, sets four strategic goals with a total of 19 key initiatives to be implemented in the next 10 years from now. (iv) Enhance regional mechanisms to promote asset creation and commercialization, particularly geographical indications and traditional knowledge. The four set goals are comprised of 19 initiatives, and each initiative is accompanied by planned actions with a member country or countries assigned to lead the efforts. DIP has published details of the plan in a booklet for seminar participants. For instance, a planned action under initiative 1 of strategic goal (i) sees a continued implementation of the ASEAN patent search and examination cooperation, with Singapore being assigned to lead this project. 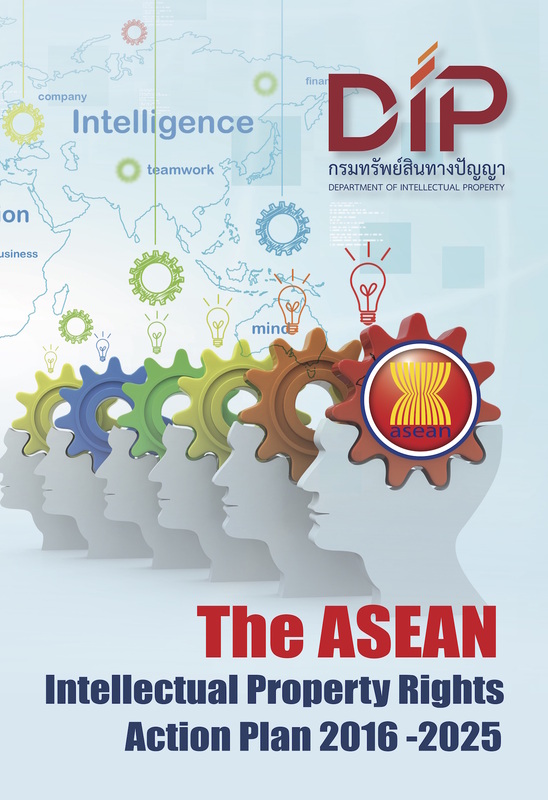 As this new 10-year plan is a continuation of the regional grouping’s previous five-year IP action plan of 2011-2015, an ASEAN Intellectual Property Portal (www.aseanip.org) has been implemented to allow search of IP information in English language of the member countries. The portal, launched in 2013, is being hosted and managed by Singapore. Sirapat Vajraphai, a DIP official who explained the ASEAN plan to seminar participants, said it is hoped that a central patent data system would be created, under which information about a patent that has been registered in one member country could be shared with a second or third member country where the patent holder plans to apply for registration. He said the second or third country should not have to carry out the examination from scratch, but should be able to make use of the information shared by the first country. However, Sirapat said the action plan does not aim to harmonize IP laws and regulations among the 10 ASEAN countries into one single system in recognition of the differences in legal systems and economic development among the members. He said, for instance, Myanmar, a least developed country in the world, does not have any IP law yet. Denis Croze, director of WIPO regional office in Singapore, said at the seminar that this 10-year IP plan would strengthen the role of private sector and of micro, small and medium-sized enterprises (MSMEs) in Southeast Asian nations. 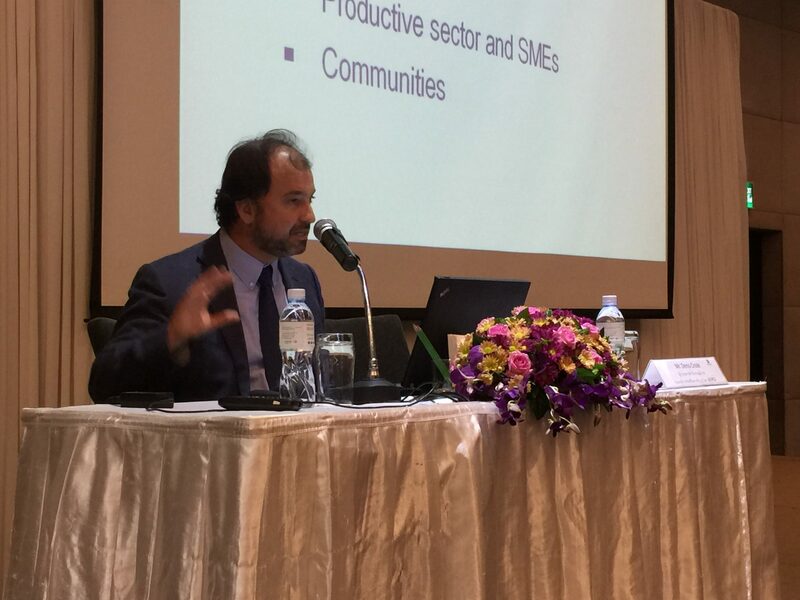 “In the next decade (2016-2025), ASEAN will provide a new emphasis on the development and promotion of micro, small and medium enterprises (MSMEs) in its economic integration efforts,” Croze said in his presentation. He said in supporting the ASEAN initiatives, WIPO plans to provide technical assistance in various aspects including developing national IP policies and strategies, capacity building for IP offices, strengthening collaboration between academics and industries and partnership between public and private sectors. Ignacio de Medrano Caballero, who is a Bangkok-based EUIPO official, said his office plans to carry out two projects with a combined budget of 12.4 million euros from 2017 to 2021, with activities to support the ASEAN IP cooperation. He said one of the projects would be more of a regional nature while the other would focus more on bilateral activities. The EUIPO projects also have elements of capacity building for IP offices in ASEAN members and training for private operators. Other elements include support for negotiations of free trade agreements (FTAs) and for implementation of FTA commitments. However, Satyapon Sachdecha, president of the Intellectual Property Association of Thailand, said at the seminar that the country still lacks capacity for innovation as the private sector does not spend much on research and development. He said this can be seen from the small number of patent applications in the country. Other Thai speakers from the private sector also complained about the high cost of patent and trademark registration overseas, which is unaffordable for small businesses and which discourages Thai operators from exporting their IP products. "Southeast Asian Countries Launch IP Cooperation Plan To Be Assisted By WIPO, EU" by Intellectual Property Watch is licensed under a Creative Commons Attribution-NonCommercial-ShareAlike 4.0 International License.